A 2015 study in the scientific journal Nature found that outdoor air pollution causes 3.3 million premature deaths every year. More than two-thirds of these premature deaths occur in overpopulated, rapidly developing China (1.4 billion residents) and India (1.3 billion residents), amounting to an unplanned, unwanted, cruel form of population control. Both China and India have extremely dense urban populations. When these high population densities are coupled with burning large amounts of firewood, charcoal or coal in millions of residential stoves and furnaces for heating and cooking (emitting huge volumes of smoke), plus increasing automotive vehicle use and growing power plant and factory emissions of air pollutants, the result can be horrific and even lethal air quality, far in excess of health standards. and growing health threat in newly developing countries. The Nature study – “The contribution of outdoor air pollution sources to premature mortality on a global scale” – estimates that the total number of annual deaths could double by 2050 without effective government intervention and widespread implementation of pollution control measures. The Nature research blames particulate matter – tiny particles suspended in the air – as the main culprit causing premature mortality. Particulate matter consists of different materials released into the air from combustion and burning, as well as “fugitive dust” kicked up by heavy equipment rumbling across disturbed soils at construction sites. Fine particulate matter – under 2.5 microns in diameter (a micron or micrometer is a millionth of a meter) – is considered especially harmful to human health because these minute particles can penetrate deep into and become lodged in our lungs. Smog obscures the view of India Gate in New Delhi, India. Researchers identified ozone (O3) – which is formed when nitrogen oxides react with volatile organic compounds (VOCs) – as the second most important contributor to dangerous air quality. Air pollution causes several conditions and diseases, including lung cancer, emphysema and cardiovascular disease (stroke and heart failure), which ultimately result in higher rates of premature mortality. In more developed countries with greater environmental regulation, such as the United States and Japan, as well as in European countries, agricultural emissions cause surprisingly substantial amounts of air pollution. Using large quantities of nitrogen fertilizers releases ammonia (NH3) into the atmosphere, contributing to harmful particulate matter. Air pollution from agriculture causes more than 600,000 deaths globally every year, the Nature study estimated. The U.S. and other developed countries generally enjoy cleaner air than we had 30 or 40 years ago as a result of technological innovations driven by regulations under the Clean Air Act that have sharply reduced pollutant emissions from car, trucks, factories and power plants. Yet even here the problem is far from solved. An estimated 6,500 Americans still die prematurely from air pollution every year. Furthermore, new research recently published in the Proceedings of the National Academy of Sciences (PNAS) indicates that magnetite – a toxic substance found in pervasive particulate matter – can infiltrate the brain, where it may possibly contribute to neuro-degenerative brain diseases like Alzheimer’s. The upshot of this research is that even low levels of pollution can potentially adversely affect long-term human health. The authors of the PNAS paper were able to precisely match extremely small particles of toxic magnetite (nanoparticles) found in the brains of human subjects with those formed during high-temperature combustion, i.e., with magnetite nanoparticles found in air pollution. Their tiny size enables these nanoparticles to travel directly to the brain through the olfactory nerve (sense of smell). Once there, nanoscale magnetite is implicated in the production of harmful reactive oxygen species (ROS), which itself is linked with neuro-degenerative conditions like Alzheimer’s disease. The extent of this possible link warrants further scientific investigation. Nature never rests, and neither does science. We are continually learning ever more about human interactions with and impacts on the millions of interlaced phenomena and biogeochemical processes that comprise Earth’s ecosphere. These crucial phenomena and processes maintain and safeguard the only habitable zone – our home amongst the stars – that we have been able to detect thus far in a vast, mysterious and unforgiving universe that is otherwise hostile to life as we know it. Not to put too fine a point on it, but it behooves us to protect this planetary home and safeguard its systems and inhabitants, human and nonhuman alike. 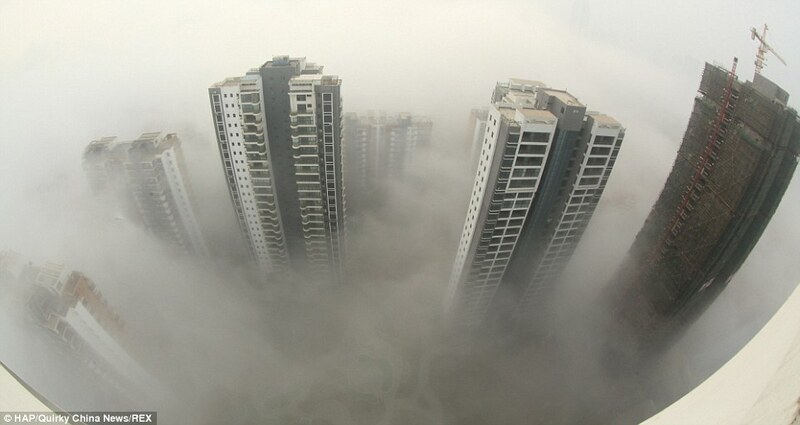 Worsening, widespread air pollution is yet another symptom of widespread overpopulation.